The burst of flowers and first warm spring nights filled with the sounds of trilling frogs have eased into the comfort of evenings warm enough for a walk, and days busy with birds proclaiming territory, building nests and laying eggs. Here at the Pocono Wildlife Rehabilitation and Education Center, the onslaught of baby squirrels has slowed, and other species fill the clinic enclosures and incubators. The rehabilitation of birds during the summer consists primarily of rearing hatchling through fledgling birds of species ranging from hummingbirds to owls. Each type of bird requires its own special housing, diet and time frame depending on its life history and needs. Baby birds vary in size from tiny wrens to nestling Great-horned Owls. These tiny fuzzy wrens are hatched after only three or so weeks of incubation and are on their own in four short weeks The large birds of prey, on the other hand take longer to hatch, and months to raise. Some birds, such as robins and sparrows are born altricial, which means that they are naked and cannot maintain body heat on their own. They depend completely on their parents to provide for their food and for warmth. Other babies are precocial, which means they come into the world less dependent on Mom. They are fuzzy, can provide most of the body heat they need, and can even feed themselves. Ducks, geese, turkeys and grouse are examples of prococial young. The mother provides protection, direction, and warmth in cool weather for her offspring. This bird stuff gets complicated! Dozens of species, no down, downy, warm-blooded, not warm-blooded…… and on top of all that, we have to figure out what and how to feed the little ones. The first thing we try and do with all orphans is reunite them with their parent. The old wives’ tale that birds will not accept their baby after a human has touched it is false. A baby bird can be placed back in its nest. These birds have no sense of smell, and more importantly, have a strong parental instinct. Another trick we utilize is that birds have no ability to count, so we can take orphans and place them in nests with other birds of their own species. The parent will adopt the orphan. The poor birds on our property work overtime all summer. We even have foster parents for most of the common raptors in our area, so that if we get an orphan hawk or owl, it will have a proper role model to raise him or her. Most nestlings that open their mouths and beg for food are provided with an insect diet by their parent(s), even if the adults are seed-eaters. Songbirds that need to grow from hatchling to fledgling in a mere month or two need a very high protein diet. We do NOT have time to catch the number and variety of bugs necessary to feed our orphans. Rather, a diet is prepared that is very high in protein and calcium that can be fed with a feeding tube every 20 to 40 minutes from dawn until bedtime. The majority of songbirds can be raised on this diet. Most of the ducklings and goslings are fed wild game bird starter until they are growing feathers (although foster parents many times take care of the orphans for us! ), and baby herons, mergansers and kingfishers must have small fish and sometimes crickets or other invertebrates. Hawks and owls require rodents and so if there is no foster parent, we cut up mice…..we won’t go there! Baby birds also have psychological needs. Some imprint easily and the resulting lack of fear they display can reduce their ability to be released to the wild. Ducks, geese, owls and hawks have the biggest propensity toward imprinting- hence using foster parents whenever we can. Others show such stress, even as youngsters, that privacy and quiet are essential to have any success with these species. Baby mergansers, woodcocks, turkeys, and wood ducks come to mind here. other part of the rehabilitation process. For us to release a Barred Owl, who prefers wet woodlands in a cornfield is as inappropriate as releasing a Turkey Vulture in the woods. Understanding appropriate habitat is important. All of our raptors are banded by a US Fish and Wildlife Service permitted bander before release. Once the bird is banded and the release location is determined, when the weather forecast looks good for a few days, our little wild orphan gains his or her freedom. If you would like to see how our facility operates, the PWREC is holding its annual Open House June 7th and 8th from 10 AM until 4 PM. 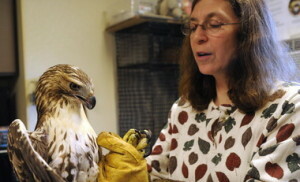 Information will be available on our website, HYPERLINK "http://www.poconowildlife.org" www.poconowildlife.org Next month, we’ll take a closer look at the kind of special care some of our patients receive in order to regain their freedom.